All India Institute of Medical Science (AIIMS), PATNA is going to released admit cards/call letters/hall tickets on 12th March 2015 for written exam which is going to be conducted on 22nd March 2015 (as per revised schedule) through notification AIIMS/Pat/Gr.’C’-4/2014 dated on 16 December 2014 advertised for 37 posts of Lab Attendant Grade II and Office Attendant Grade II on the regular basis. A lot of numbers of candidates had applied for exam. The Latest News for those candidates who had applied for AIIMS PATNA Exam 2015 and waiting for Admit Cards Call Letters can get their Admit Cards Call Letters from the direct link provided in the end of post. · Enter Registration ID and Date of Birth of the candidates. · Download Admit Cards Call Letters appear on the screen. · Save or Print the Admit Cards Call Letters in PDF for exam. 2. Read all the instruction provided in the Admit Cards Call Letters and ensure the documents required such as ID proof i.e. driving license, PAN card etc. 4. Affix colour photograph of same image as provided in the printed Admit Cards Call Letters to the provided space. Do a cross signature on the pasted colored photograph pasted by the candidate. 5. Admit Cards Call Letters must be signed properly below the Colored photograph paste by the candidate. The signature must be same as it is appeared in the computer generated Admit Cards Call Letters. 7. Candidates can download their Admit Cards Call Letters any time on the official website direct link provided below. Ensure that candidate must have Admit Cards Call Letters of EXAM along with Original ID and a photocopy of the Original ID. Reach the Venue at least 20-30 minute before the time mentioned in the computer generated Admit Cards Call Letters. Check for the list of sitting plan according to the name of candidate and roll no. appeared in the Admit Cards Call Letters. Search for your name and roll no. Note down room no., floor of the room & seating position of the back side of the Admit Cards Call Letters page. Computer Generated Admit Cards Call Letters, Original ID and Photocopy of original ID will be checked twice by Personnel/Officers. Reach to EXAM Room and ensure the sitting plan on the sheet pasted outside the EXAM room. Mark the signature on the Attendance sheet and sit on the designated computer to your Roll No. It is advised to the candidates to reach the venue at least 30 minutes before the time of reporting. This recommendation is provided to relax your mind from expedition of route and prepare for EXAM for performing well. Don’t forget to bring computer generated Admit Cards Call Letters affixed with a coloured photograph, An Original ID Proof and Photocopy of the same ID proof which take to the venue of EXAM. In any confusion/dilemma/Illusion don’t hesitate to ask to the officers who are designated there for the help of candidate to reach to the EXAM room. The AIIMS PATNA Exam will be conducted on 22nd March 2015. The AIIMS PATNA EXAM 2015 will be conducted by Pen MODE. In Pen Mode, OMR sheet will be filled by Blue/Black ball point pen. Written Exam for Lab Attendant will be conducted in the morning session from 10:00 AM to 11:30 AM & Written Exam for Office Attendant will be conducted in the Forenoon session from 2:00 PM to 3:30 PM. AIIMS PATNA Exam will be an objective /multiple choice question paper consist of various sections contain various questions. The exam will be a multiple choice question paper in which four options will be provided out of which candidates need to choose one correct answer. The time duration of exam will be of 1 ½ hours or 90 minutes. Short Listed candidates based on the performance in written examination will be called for personal interview. The interview will be conducted by the AIIMS Panel/Officers. The Finally Selected Candidates based on the performance in interview and written exam will be called for document verification of the candidates. In the document verification stage, original document of candidates will be checked out. 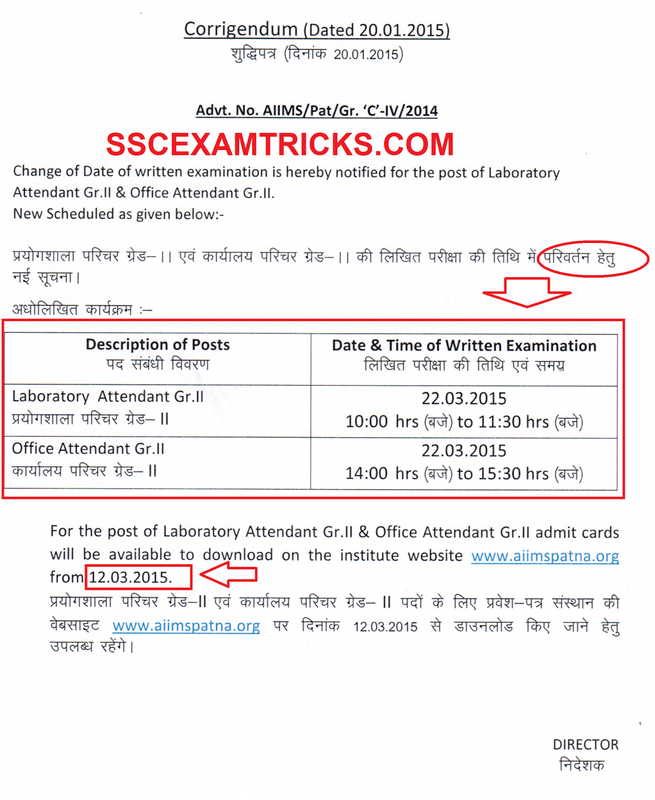 Click here to download Revised schedule of Examination of AIIMS Patna 2015.